Rosenbauer and Sasgar are currently conducting a roadshow of the latest generation of Firefighting appliance from Rosenbauer. They are visiting a number of cities and Fire Services on the East Coast. For more info, search Facebook or Google for the respective companies. 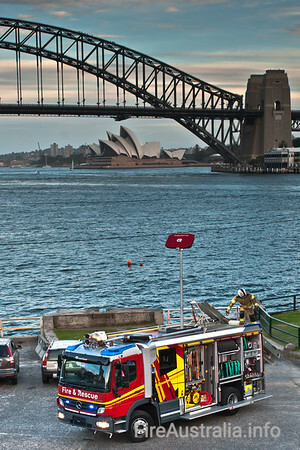 I was invited along for a photo shoot around Sydney Harbour. Unfortunately a late storm front came in on an otherwise fantastic Sydney evening. With the tough lighting, particularly lighting the appliance I ended up going for some over the top processing to beef up the appliance. Please leave comments on this post or the images if you have any opinions or suggestions on the processing. Click on the image to view the full gallery.